See, and you thought I was making stuff up in my Mystery v. Murky post. Aside from keeping our books away from cockroaches, there are a few other things we can look at here to better inform our writing process. 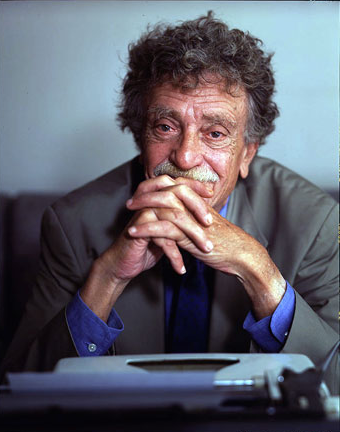 Really, Vonnegut’s encouraging us to look at writing in a different light. We’re often told to create mystery and suspense. Why then does Vonnegut tell us to forget about it? Because we’re too wrapped up in it. We aspire to create mystery to the determent of other, more important “rules.” Some of these rules include telling a coherent story, using foreshadowing to help illuminate the ultimate outcome. I think of Flannery O’Connor’s advice to have a story end with an action that is both genuine and unexpected, something completely in character, but that transcends character. I don’t know if O’Connor and Vonnegut ever hung out, but they probably should have. Can you imagine their conversation? You may find yourself disagreeing. You may feel that if the reader knows where the story is going, they will get bored, call the book “predictable” and put it down. I think the key to mystery is allowing the reader to accurately “guess” the ending at the right time. As Brandon Sanderson says on Writing Excuses (which, by the way, if you don’t listen to this podcast, you should. Find them on the iTunes store. It’s free and totally helpful, though slanted a bit to fantasy/sci-fi), the best endings are the ones that readers “guess” a few pages before it happens. They’re able to do so, because the writer has taken the time to set it up with foreshadowing and a healthy amount of detail. Essentially, you tell your readers the ending ahead of time, and they feel like they “guess” it. That way, at the end of the book, they’re satisfied, and they feel better about themselves. If they can’t accurately guess the end, they’ll feel like you’ve tricked them. If they guess too early, then they’ll call you predictable. Like Johnny Cash, we’ve a fine line to walk. Please don’t forget, I’m taking suggestions for my next few topics. If you have questions, comments, or concerns, either on something specific you’re working on, or on the craft in general, feel free to leave a comment or e-mail me (adgansky@msn.com).